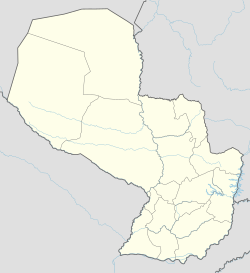 Ayolas is a city in the department of Misiones, Paraguay. It is, also, the name of the district within which the city is located. The city takes its name on behalf of Juan de Ayolas, second of Pedro de Mendoza, who founded Puerto la Candelaria, now Fuerte Olimpo, on the Paraguay River. He is believed to have been killed by chaco Indians, because he disappeared and never was heard of again. Ayolas is located on the south of the country, near the towns of Santiago, San Juan Bautista and San Ignacio. It's a very simple fishing town, located 310 km away from Asunción, on the Paraguayan River. In the summer, the maximum temperature is about 39 °C, the minimum in winter is 0 °C generally. The annual media is around 21 °C. Ayolas has a population of 15,219 inhabitants, from which 7,749 are male and 7,470, female. In the rural area there are 10,851 and in the urban area, 4,368 people; being the second city most inhabited of the department, after San Ignacio. The city of Ayolas was founded in 1840 by Patricio Aquino, on a request made by José Gaspar Rodríguez de Francia. In Ayolas, the Binational Entity of Yacyreta is located within the city area. When the dam was being built, the city was projected from scratch right next to the original town settlement (also known as "el pueblo" locally) so that the work force could be properly lodged. As such the Villa Permanente was raised in 1979 as a model town with 4 basic house models in a very organize arrangement, as well as modern schools, malls, water treatment plant, hospital, Police stations and a bus terminal. As the dam project advanced and more work force was needed the same process led to the creation of the “Mil viviendas” (Thousand houses) or "Nucleo 1" and then "Nucleo 2" housing neighborhoods in the mid 80s. These housing solutions was offered free of charge to workers to encourage them to move from more populated cities. In most cases the regular utilities as potable water, electricity and phone where covered by the employer, at least until the late 90s. The people from Ayolas are dedicated to cattle breeding and commerce, besides fishing. You can get to Ayolas taking a detour on the Route I Mcal Francisco Solano López, after the town of Santiago. The city is home for the Juan de Ayolas Airport, however, there is no commercial air traffic at the airport. Near the town you can find the hydroelectric Yacyreta, “country of the moon”, by the location near an island where you can find unique ecosystem in Paraguay. We can mention the forest of Arary as well as the lagoons. This dam provided a lot of work to people from the town and surroundings, and it is an Argentinian and Paraguayan work. In Ayolas, there is an arqueologycal museum with objects found in the zone, such as urns for the Indians of the region, as well as many animal and vegetables species. The town of Ayolas is a total enjoyment for the fishermen, for the characteristics of the zone and the extraordinary fishes, such as boga, dorado and other species. The beaches of Coratei and San José-mí are very visited. In the church of San José-mí, there is a Virgen Mary, stuffed with straw, from the jesuit times. In September they celebrate the Arary Festival, which takes place at the Theatre of the Mil Viviendas, and many Paraguayan and Argentinian artists play. This page was last edited on 14 February 2018, at 21:37 (UTC).